Intestinal Health is a breakthrough book designed for people affected by digestive issues from diverticulitis to leaky gut, from GERD to chronic gas, constipation, and other ailments. It will improve the lives of anyone who wants to maximize their digestion, increase good bacteria, decrease symptoms of discomfort, and heighten cellular oxygen levels resulting in complete abdominal comfort. Acid reflux, gastroenteritis, a sluggish metabolism and Crohn’s disease are all common enough maladies in today’s fast-paced culture, where we often eat in our cars or in front of our TV sets and have very little time for cooking and enjoying whole foods, let alone thoroughly chewing them. Mardell Hill is an i-ACT Certified Colon Therapist. She trained as a colonic therapist and has built a successful cleansing business since 2005, combining a long standing history in athletic training, post-rehabilitation, nutrition and functional fitness training into helping clients achieve optimum health. In her center, she runs colonics , teaches health through nutrition as it pertains to intestinal rebuilding, and offers support for additional cleanses such as, liver, gallbladder, kidneys, and skin. She has successfully treated more than 3,000 clients. She encourages people to blend alternative and standardized medicine to complement, support, and maximize their health as a whole. The local papers have published articles on colon therapy and featured Mardell in Boulder County Kids, Spring 2010 and Times-Call, January 2008. More about the Author – Mardell Hill has dedicated her life to helping others. Read more about her story and her vision. With 42 years of vegetarian diet and lifestyle ‘under my belt,’ I thought I knew a decent amount about good health habits and common sense. 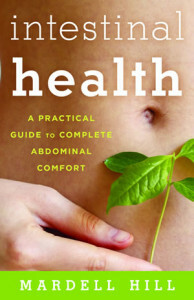 Mardell’s wealth of information, presented in her guide on Intestinal Health, opened my eyes immensely. Intestinal Health” provides answers about our digestive system. I appreciate the organization of the book. It starts with an overview and each chapter addresses a specific question. It is written in an easy understandable conversational manner. The information answers questions I want answered. Having this aid to keep my digestive system healthy with help me be healthier and happier. I have suffered with rheumatoid arthritis for 30 years and have pursued many health remedies over the years. Some have helped, but I finally realized I needed to do internal cleansing. There are two observations about this book: (1) It covers every element of the digestive system, what they do and how they all work together. (2) It is communicated in a very practical way to the “lay” person. People just need good, clear basic information they can easily read to be well informed (such as my 20 year olds, who have various health problems, and are NOT going to do a lot of research, but are willing to read a book that is not extremely detailed, but very clear and informative).Definitely a great resource! Even though I have done much research over the years, this brought it all together to me in a very understandable way. I just finished reading your book and I want to tell you what a great job you did. The material you covered is very basic and yet is presented in a clear and concise way. I do not remember having information presented in such a complete manner in my college nutrition classes. I have spent most of my life studying and learning about natural health. I have been to several naturally oriented MDs, Naturopaths, and Healers. I have gained a lot of knowledge and experience about digestive health. I appreciate the directness and simplicity of this book. I spent over seven years working in a vitamin department of a local health food store. I spoke to hundreds of customers about digestive issues and how to support their bodies with healthy diet and supplements. My favorite part of the book is the checklist. I think it is a great tool for seeing where someone is on their diet choices. Many customers thought they were eating healthy, but had room for improvement. A visual chart to work with daily is a perfect solution. It serves as a reminder to me to stay focused on fresh organic foods and stays simple. I already have this knowledge but get busy in my work week and sometimes miss the mark. There are two other sections of the book that support my healthy lifestyle as well. I got a great reminder to be more vigilant about my exposure to bacteria and the negative impact on my health. I experienced the negative impact of contaminated flood waters on my colon health recently. Receiving colonics had a positive impact on my recovery. Lastly, I learned something new about the impact of enemas on colon health. I did not know that they can negatively affect the way the colon muscle works. In my experience many people I talked to in the health food store had colons that did not work efficiently. Most natural health care providers and books recommend enemas on a regular basis. I understand the benefit for me personally of not overdoing enemas and taking colonics as part of my digestive health regimen. There is so much wisdom in this book. By showing how the body works from the mouth to stomach to excretion, Mardell takes the mystery out of digestion by offering insights into the process. Most books about diet and nutrition will tell you what to eat, but Mardell shows you how to get your body working in harmony for optimum long-term health. It is a solid guide for anyone wanting to improve their well-being. I can’t say enough good things about this book. I read the entire book in one sitting. It was so interesting and informative that I couldn’t put it down. The book describes the entire “Digestion Highway” in simple terms and has great analogies that make it even easier to comprehend. It states the best way to eat to make digestion more efficient. It also provides a very detailed explanation of how food gets digested and what happens through the entire digestive system. I found the smart food practices, like picking up perishables at the end of the shopping trip and tips on washing raw veggies very helpful. There are fantastic recipes in the book and I’m looking forward to making the Cabbage Salad and “Mardell Bark”. Mardell even included her own meal plans. There is an intestinal health checklist that gives great examples of the best food options to choose. I tend to experience constipation when traveling so I am going to follow Mardell’s travel tips when I go on my next trip. If you were ever wondering ANYTHING literally anything about your digestion, constipation, feeling gassy or just plain miserable after eating; Mardell’s book is a must read…even if you think you know your body! As a frequent traveler and a woman who has taken nutrition and anatomy courses (post college) I learned a tremendous amount, and have become an avid client receiving colonic treatments at least two times a month. Owning your own wellness is key, but having a “coach/mentor/friend” to help is invaluable; Mardell is that person. But ultimate it is your own journey. My outlook on my health and my eating habits have changed, while I think they were pretty good (you will be able to see in the worst to best nutrition/health table). I am very conscious of what I eat and what my family eats and how we eat – slow down and CHEW. Get the book, read it cover to cover, and then buy one for a friend. Don’t give your copy away – you’ll only have to buy yourself another and re-highlight it.